Sunday nights these days seem to be full of London’s musical theatre performers occupying various cabaret venues to showcase their (not unremarkable) talents, accompanied by a whizz of a Musical Director and maybe a guest or two thrown in. The evenings are invariably lovely and the talent on offer is always choice. 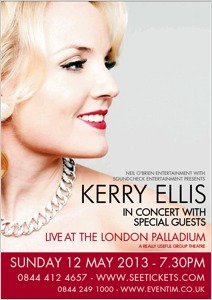 It takes a rather special star however to display not just talent, but awesome showmanship and thus it was this Sunday night at the London Palladium where Kerry Ellis, onstage for the best part of two hours and accompanied by some outstanding guests wowed a packed house. Ellis' set had been preceded by Woman The Band, who warmed up the evening with 30 minutes of chic chick rock that included clever covers of I Don’t Wanna Talk About It as well as Sweet Child Of Mine. Lead singer Mazz Murray (who like Ellis has significant previous from We Will Rock You) fronted the trio well and they set the crowd up nicely, with just the right tone for the show to follow. The curtain rose and sparkling in a black evening dress and with heels that were either to die for or to be killed by, Ellis strode to centre stage, commanding the vast auditorium with John Barry and Don Black’s Diamonds Are Forever in the arrangement from her album Anthems. Adele’s Skyfall (arguably the best part of that particular Bond) was the next number and again, Ellis made it her own. As the Bond medley segued into Live And Let Die mixed with Goldfinger, many in the audience were perhaps hoping that Barbara Broccoli might ask Kerry to record a future Bond theme. Ellis may not (yet) be a global rock star but her vocal presence is more than a match for the demands of the 007 franchise. Eon Productions, please take note. Lyricist Black is clearly an inspiration to Miss Ellis. As her set went on to include his I Can’t Be Your Friend from Anthems, together with a later brace of Tell Me On A Sunday classics, the evening almost verged on being a modest tribute to the writer who was sat amongst the Palladium throng. Ellis’s vocal power and presence at times strongly suggested the potential of an English Streisand and the arrangements for her concert prepared by talented MD Craig Adams, were innovative and refreshing. In a nod to her My Fair Lady roots, she tackled the song that was never hers in the show, On The Street Where You Live and the tender rock beat that Adams had infused into the melody was an inspired touch. I Could Have Danced All Night similarly had a rock pulse to it that invigorated a very familiar and comfortable showtune. When her orchestra then oh-so gently released the intro to Sondheim’s Losing My Mind, spines tingled in anticipation awaiting her treatment of the spectacular song and again, Ellis did not disappoint. As Long As He Needs Me was given an authentic "mockney" treatment that served the number well and as her first hour drew to a close she sang I Dreamed A Dream, again with a distinctive sound that set it apart from the original. As she tackled the massive middle 8 of that modern classic, she sent the crowd into their first frenzy of the night. Passions ran so high that a Doctor needed to be sent for and slipping quietly onto the stage the bobbing mass of silver hair that is Dr Brian May, Queen legend and who if he wasn’t so damned wholesome could easily be mistaken for Ellis’ Svengali, took his place beside her. In 2002 May recognised the singer’s potential when he was putting together We Will Rock You and since then he has been visionary in guiding the younger woman to critical acclaim. In an acoustic treat her voice and his guitar created a remarkable version of I Who Have Nothing. The Streisand suggestion that had emerged earlier in the evening was sealed when with May and the strings of the Bergersen Quartet, Ellis tackled the diva’s signature tune, The Way We Were. The clarity and beauty of the modern harmonies was rare and not for the first time, an oh-so familiar song was given a completely fresh interpretation. The second frenzy of the night came soon after, as with acoustic replaced by electric, May led her and the audience in Crazy Little Thing Called Love. The Queen man then magnanimously exited and in a nice touch, a modest medley of Michael Jackson numbers was Ellis' tribute to the King of Pop, Billie Jean proving the most inspired of the selection. With the stage bathed in a green floodlit wash, there could be but one finale and as the opening chords of Defying Gravity sounded and free of the constraints of having to sit quietly in the Apollo Victoria, nearly every man woman and child in the Palladium whooped their appreciation. The screaming only increased as one by one, Ellis was joined by Alexia Khadime, Rachel Turner, and Louise Dearman (a former Glinda no less, and the sole actress to have ever played both of Wicked's witches), for what can only be described as the most spellbinding and talented British coven ever to grace a London stage. These four Elphabas gave a unique performance, that as well as celebrating Ellis’ stardom on the night, also recognised equally the talents of these three enchanting sisters of sorcery. Of the several encores that the over-running show stretched to and with Ellis accompanied by May and the heavenly voiced Arts Ed Choir, No One But You (Only The Good Die Young) proved a moving yet profoundly inspirational end to an outstanding evening. There is talk of this concert touring the UK and such talk should be fuelled and encouraged. It is simply a privilege to hear the talent that is Kerry Ellis and in the event that her gig does pitch up in a town near you sometime in the future, go buy the best tickets you can afford. You will not be disappointed.